BTST Academy has an outstanding team of dedicated instructors, all of whom are determined to help students succeed on our sports massage courses and beyond. Our team members offer support and guidance, uniquely tailored to each student. Our goal is to provide an environment where everyone is valued for their outside-the-box thinking, creative ideas, and dedication to improving themselves and others. Becky is a highly qualified, versatile Level 5 therapist with extensive experience and a commitment to helping people. Becky is currently in her 5th and final year at Staffordshire University working towards her Osteopathy degree so fully appreciates the demands of study. Already qualified in Sports Massage, Acupuncture, Spinal Manipulation, Cupping therapy, Personal Training and Swimming instruction, just to name a few. She also appreciates the demands of high level sport, as a previous County Swimmer and current Figure Ice Skater she knows all too well the benefits of therapy as a patient and practitioner. 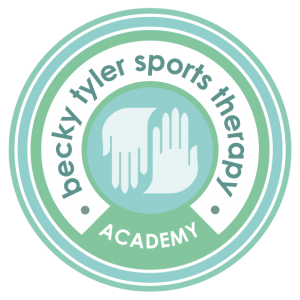 Becky also is the owner of BTST pain management & Sports Massage Clinic where she treats patients of her own. Keith is an experienced Sports Therapist who has been working in the Sport and Remedial therapy industry since 2011. With a Masters Degree in Sports Therapy he supports a variety of Musculoskeletal injuries with experience in professional and amateur sport and working with the general public. He acts as an educational practitioner by delivering, assessing and quality assuring on a range of higher education and professional courses in Sports Massage and Sports Therapy at the University of Essex, the University of Lincoln and various training providers across the UK. He is the East Midlands Representative for the Sports Therapy Association and can be found speaking at a variety of conferences in his interest area of neck injuries in rugby players. Erica has a Level 6 Masters Diploma in Advanced Clinical Sports Therapy and a Sport and Exercise Science Degree from Loughborough University. Erica runs her own clinic in Leeds and has worked with many different sports and athletes including Team GB Diving and Swimming, as well as elite rugby, football and cycling teams. She regularly travels with work providing treatments to athletes at events all around Europe, predominately for cycling. Erica is qualified in Sports Therapy, Sports Massage, Medical Acupuncture, Kinesiology Taping, Instrument Assisted Soft Tissue Mobilisation. She is passionate about developing her knowledge and finding the best ways to treat people. She is currently training to become a nutrition coach alongside her Sports Therapy work. Erica has been teaching for the past 6 years, travelling to different university’s around the country to teach level 3 and 4 sports massage courses to Physiotherapy and Sports Science students. Adam has worked as a full time sports massage therapist for the last four years in a self employed capacity. He has worked with elite athletes from team GB and worked abroad supporting these athletes in international competitions. Along with this, Adam has worked in professional football at a number of clubs in the local area, working behind the scenes and pitchside. Adam alongside Teaching & Assessing runs his own successful sports massage business, where he treats a range of conditions. More recently Adam has created a link with his local NHS with practices opening in several GP surgeries to offer treatments to help people with a range of injuries. Previously, Adams work experience has been within a number of professional football clubs in a full time employed capacity. Adam also lectures for two universities on their undergraduate and masters level courses supporting sports therapy learners to master the art of sports massage. Tanya has been a qualified Level 3 Sports Massage Therapist for 12 years. After being plagued by injuries from competitive running and being treated by a local sports massage therapist herself she knew it was an avenue she wanted to pursue. She has focussed solely on her massage therapy business since 2013 after hanging up her fitness instructor shoes. She has actively been involved in sport since being a child and has been a gymnast, county swimmer, competitive runner, fitness instructor, road cyclist (qualifying to represent GB in her age group in the UCI Road Race in 2016) and more recently has joined the body building/bikini fitness athlete world. Her passion for sport, biomechanics and nutrition has led her to take many other qualifications to enable her to have a better understanding of how the body functions. These include Kinesiology, Acupuncture, Spinal Manipulation and Mobilisation, several more holistic therapy treatments, Pregnancy and Baby Massage, Fitness qualifications and also her teaching and assessing qualifications to enable her to be able to share her knowledge with up and coming therapists.